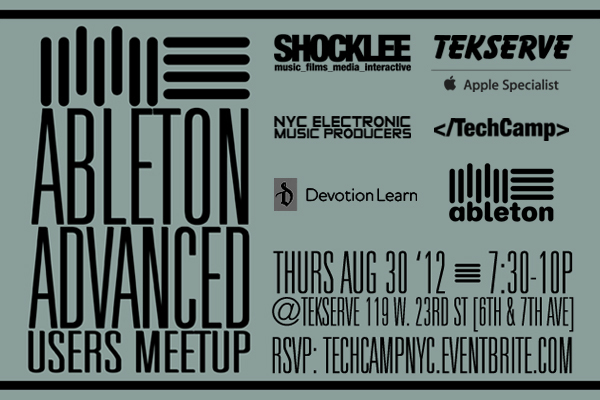 [NYC] Thursday August 30th: Ableton Advanced Users Meetup – At Tekserve! Join us on Thursday August 30th from 7:00-10:00pm for the next installment of the Ableton Advanced Users Meetup which we are excited to announce is making it’s debut at New York City’s finest techno-cultural-audio-visual retail hub for all things Apple related, Tekserve! Also in the building, will be the NYC Electronic Music Producers Group led by Ben Casey and Brian Jackson representing Devotion Learn. We’re joining forces to bring together some of the most knowledgable Ableton users in the NYC area for a fine line-up of presentations on some of the coolest uses, trends, tricks and applications happening around so don’t miss out – come and network and maybe you can come present something special at an upcoming event! Ben Casey is an Ableton Live ninja whose passion for electronic music landed him in London, where he helped launch the label Werk Discs and earned a Masters in music composition from Goldsmiths College. In addition to performing live alongside a multitude of artists such as Jamie Lidell, Actress, and DJ Surgeon, he’s helped construct and tweak Live sets for Grammy-winning musicians, American Psycho on Broadway, and Everett Bradley of STOMP! Ben is currently based in NYC where he teaches several classes and seminars at Tekserve, including “Introduction to Ableton,” “Digital DJing,” and “Live Looping.” He is a regular contributor to the music tech blog Bangbang-nyc.com and spends much of his free time competing with his cat for access to his synthesizers. Ben will show off tweaks for your hardware that can take live remixing and DJing to another level. Nicholas Shelestak performs the role of keyboards and electronics with the band EXITMUSIC, and solo as foursided. He will be discussing how Ableton Live is utilized as a fourth instrument in a band, playing the roles of everything from massive synth and sampler rack, backing tracks, monitor mixes for other members, master sync for other member’s gear, and what he uses to control it all, such as multiple iPads running a Lemur and TouchAble and other iOS apps, hardware MIDI controller and foot controllers. He’ll also talk about the scope of dangers and benefits of using a computer on stage with other members, and what hazards and blessings have been encountered in a year of touring. Brian has more that 12 of years of experience as a mixing and mastering engineer. One of the first Ableton Certified Trainers, Brian is Co-Founder and Director Of Education at Devotion Gallery, Brooklyn. He is going demonstrate how to get great results out of Ableton Live’s flexible Compressor device. This demo will focus on the two least understood aspects of compression technique – the mix buss and mastering. Adriano will demonstrate the Beatsurfing App for iPad, with Ableton Live. Beatsurfing is a MIDI controller Builder that let you surf with your fingers along custom routes, colliding with objects, triggering samples or effects. It’s unique architecture allows you to set objects behaviors and has an intuitive in-App editing. Jace Clayton aka DJ Rupture is an interdisciplinary artist based in New York City. Rupture will be demonstrating his Sufi Plug Ins, a free suite of 7 plug-ins for Ableton [Max4Live] that explore non-Western ideas about sound in interaction with alternative interfaces. The plug-ins include four synthesizers hardwired to North African & Arabic maqam scales with quartertone tuning built-in, a device called Devotion which lowers your computer’s volume 5 times a day during call to prayer and a drone machine. The interface is written in the Berber language of Tamazigh, using their neo-Tifinaght script, and roll-over of the UI provides snippets of Sufi poetry. Space is limited – RSVP is a must! The audio tech event of the year – IMSTA FESTA hits New York City September 22nd, 2012. Register for free today!